This day began for Milton at 5:30 am. 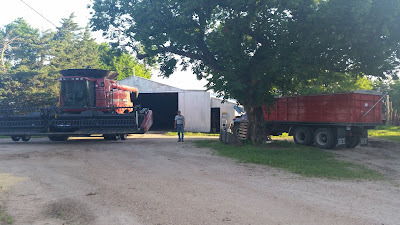 He unloaded the semi from the last cut of wheat from the night before. 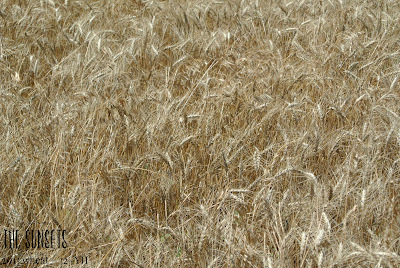 This will be used as "seed wheat" for next wheat crop. I made my way over about 6:30 am and we unloaded the soybeans I had picked the day before off the pickup and trailer. 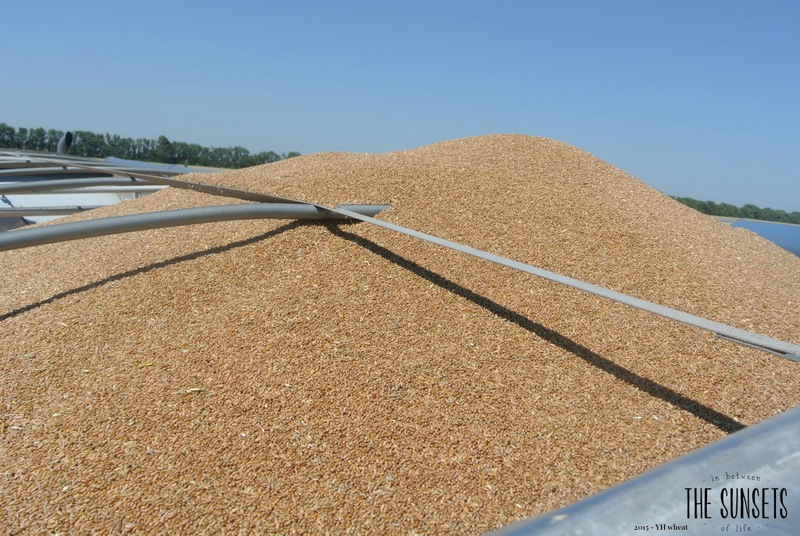 Then they were loaded into the grain drill so it is ready when needed. Corn is going back into a field we harvested yesterday of wheat. Milton went out to see if it was too damp to start planting. It was so he headed to a soybean field to replant some that the grasshoppers enjoyed! Wheat harvest started back up around 11:00 am and the field we are currently cutting has produced some really good wheat for us. Milton's brother V. came to drive combine so he could go plant corn. RV (Milton's dad) is the truck driver and hauls the grain. 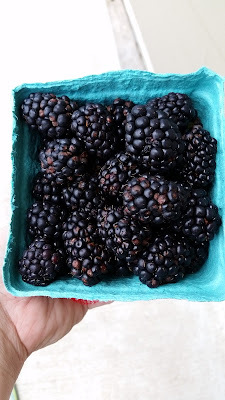 PV & I made a quick trip to Elderslie Farms where I get my blackberries for jam making this morning. I will need to get that done in the next couple days! Day 9 was our last day in the field. We didn't start until about 2:00 pm. We spent our morning as a family worshiping our Lord and had a great potluck afterwards! We did finish the wheat harvest (minus a couple muddy spots) about 9:30 pm. 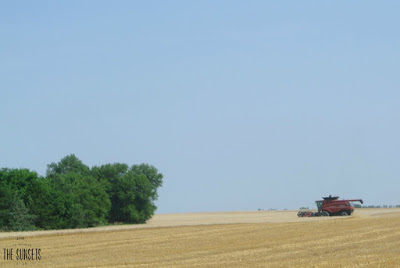 We are including a video of Milton running the combine on our last field. I will do a wrap up post when I have more time. Now I need to focus on getting life back in order and help the farmer as much as I can in the planting season! 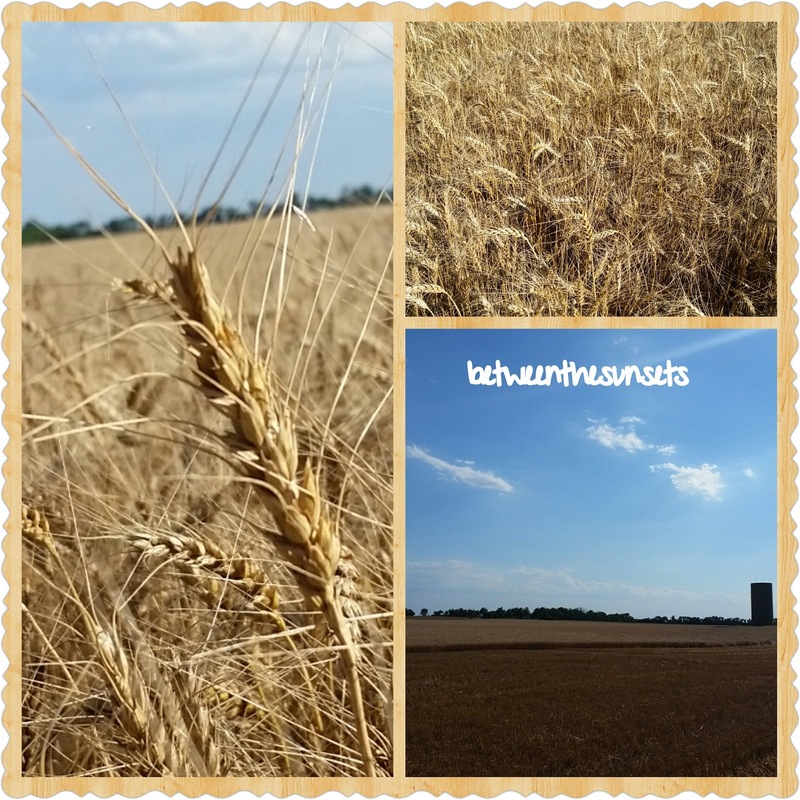 Thanks for following our #wheatharvest15! Opportunities to follow our family farm adventures! Pick one and join the fun! Emails directly to your inbox! Be sure to sign up in the top right hand corner of blog! What Kansas is known for. 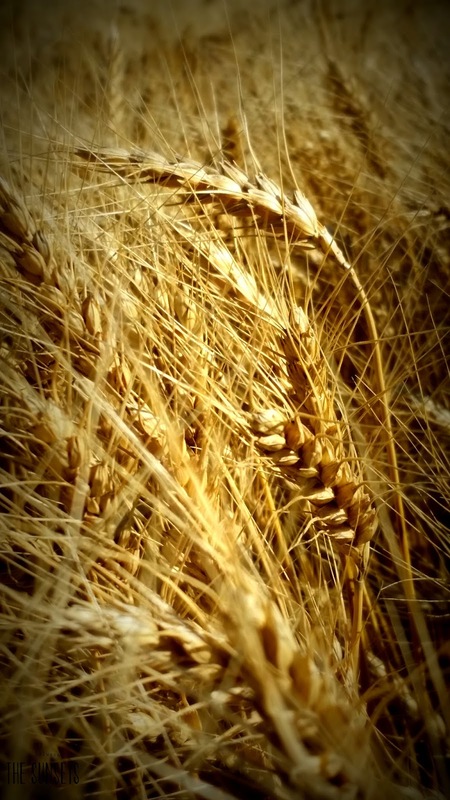 WHEAT! Day 6 ended like this. My husband normally helps me in my #pfwg44thbirthday challenge but the timing didn't work this time. 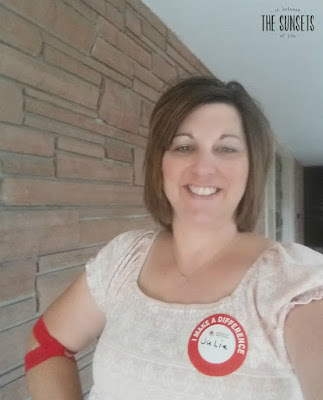 So my day started out by donating blood alone at a closer location than we normally use. It went rather quickly and it helped save 3 lives. I was in and out in less than one hour, no kidding! Please consider helping others by donating blood, they are especially short in supply during the summer. 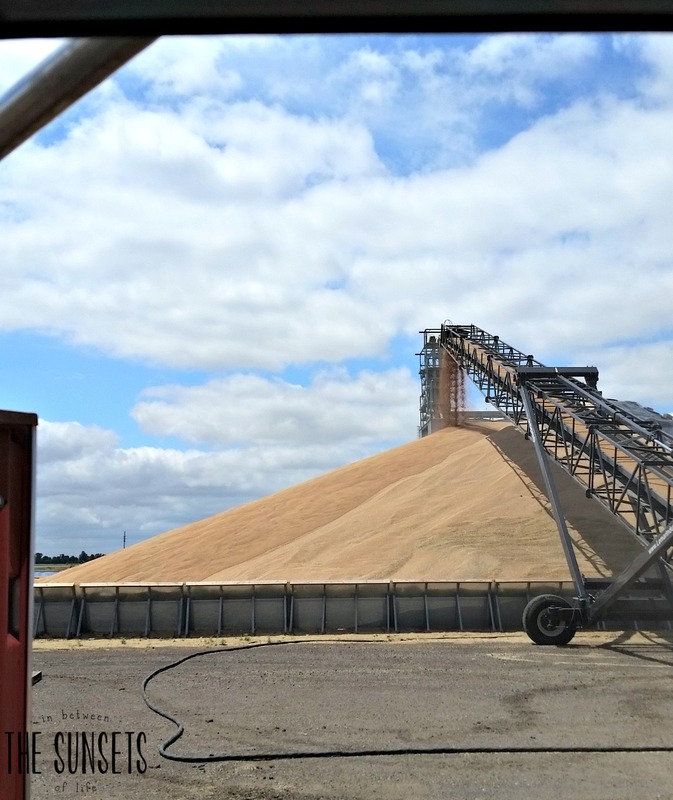 When I returned home Milton asked me to come with him to haul the Chevy grain truck that was loaded with wheat to the new grain terminal. It had rained and he couldn't cut yet. This way I could practice driving with it loaded. I don't feel I did even ok, let's just leave it at that. It was interesting to go to the grain terminal where they load railroad cars with wheat. I will write a post on that later but here are a couple pictures of the location! I'm working on becoming more a farm wife verses farmer's wife and I got a little closer today. 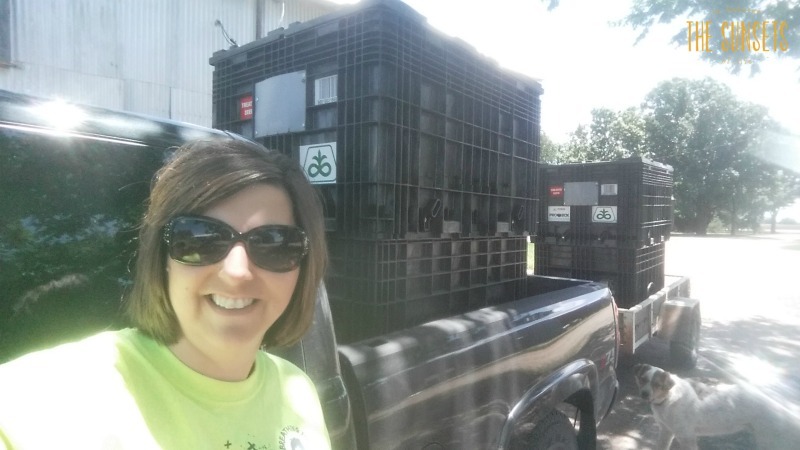 I headed to get soybean seed a few miles away from our farm on my own. This may not be a big deal to others but to me it was. I headed home with a heavy load! Milton finished one field he had started cutting yesterday. Then headed to try another one. The wheat looks really good on it but the straw still had green in it. So he was off to another field! He finished the field with some extra passengers. 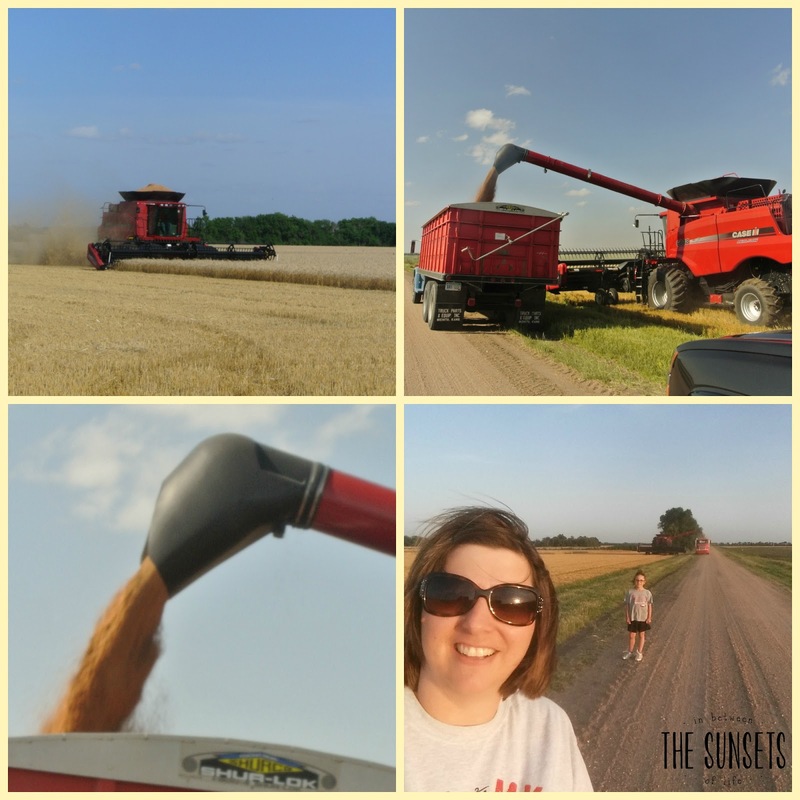 We love to give combine rides! The young man was 4 years old and we love him to pieces! 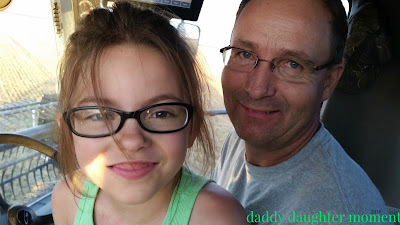 After K rode in the combine we moved to a new field and he was my sidekick in the grain truck. It's was so cool to see him so excited about all things farming! One of my favs. PV & K waiting for the combine. 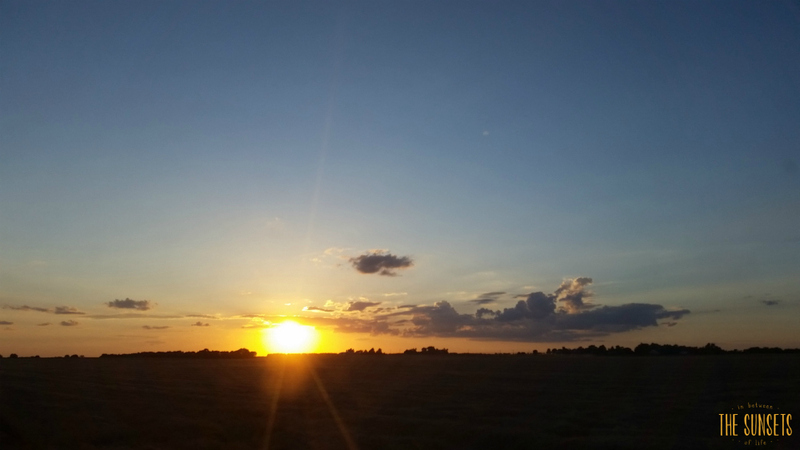 Combine rides & beautiful skies. Kansas is good! PV & I were able to finally spend some time in the combine with Milton. These two make my life so much fuller, I'm grateful she has the opportunity to be raised by such a good father. Even the smallest moments matter folks! Treasure them while you can! The post today really showed you what happened between our sunsets from day 6 to day 7. 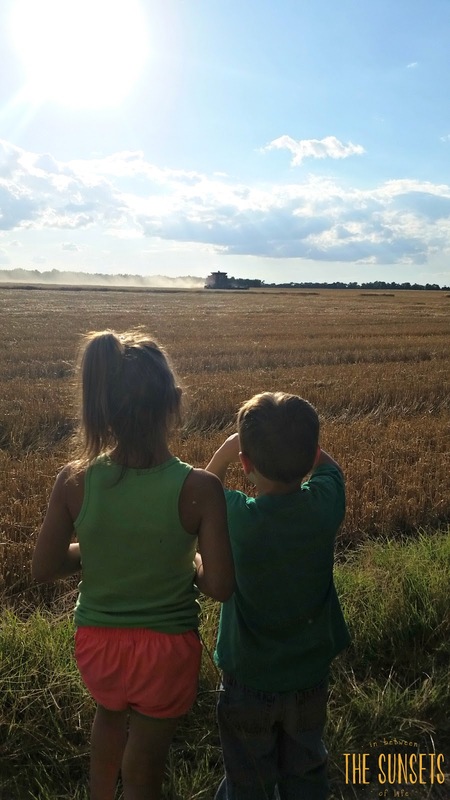 We will close on sharing the view from the combine cab. Both nights were pretty spectacular! This is when the days get really long for Milton. He wakes early to plant the next crop to go into a field. He started this morning planting grain sorghum (milo) into a field that had been sprayed a few days ago for all that yellow/green you see in the field. The rain kept them from spraying as early as desired but it will all work out in the end. It's just not so pretty right now! Come fall, the sorghum will be beautiful! Our planter isn't large but it gets the job done! The ladies of the farm helped out by heading to get fertilizer for the planter. This was the first time I ever did something like this. :) Just me and my sidekick! 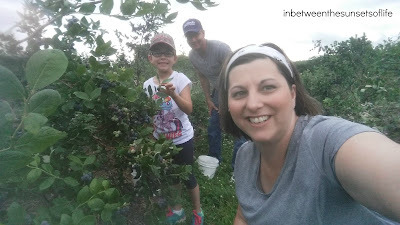 Baby steps to becoming a farm wife from a farmer's wife! I made a second trip late in the day by myself, my sidekick decided it would be funner to hang with her cousin at the farm. Milton's brother came and helped out by continuing to plant the field that had been started. RV drove trucks and LV weighed them as they came in. 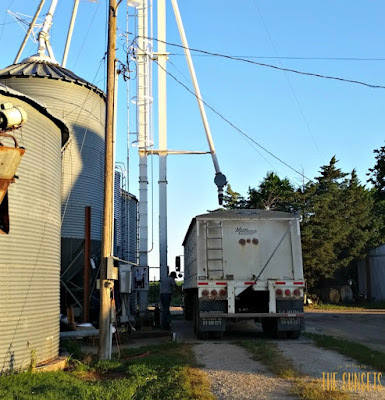 Our bins are all full but one now so the trucks will be hauling to the grain elevator now. Takes longer as there are usually long lines but like I said before, it all works out in the end! 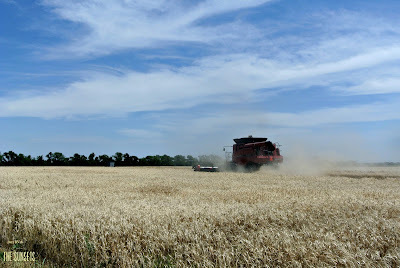 Milton was able to harvest a field that we lease and then headed to a new one later in the evening. The combine is working out quite well and we are very happy with it. 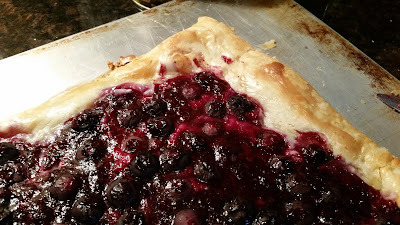 Harvest meal was roast, two salads, and a blueberry puff with cream cheese. 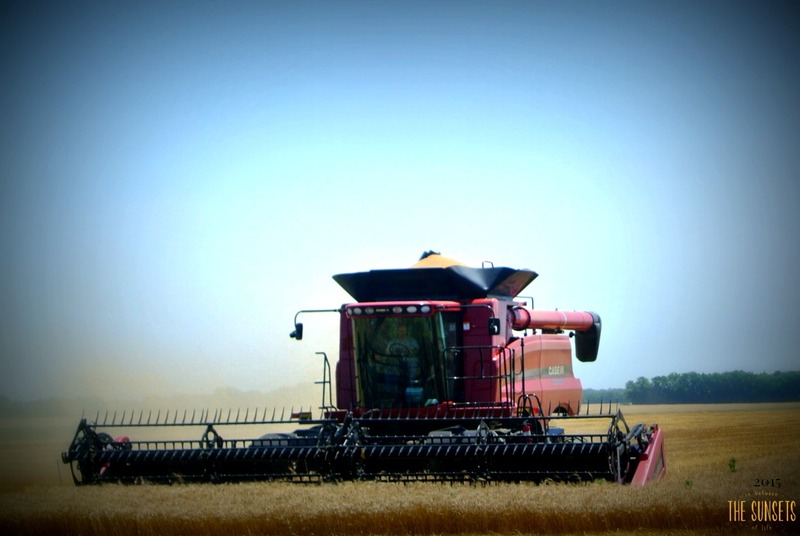 That's a wrap for Day 5 of wheat harvest! Milton unloaded the truck from the last cut from the night before, did some maintenance type stuff, and took his tractor and planter to a field. He wanted to get it setup so it was ready to go tomorrow. Milton will rise very early and begin grain sorghum planting in a field that he just harvested wheat off of. The photographer was too busy to get many pictures today. 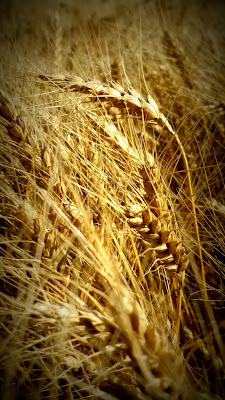 They traveled to several fields and harvest is going well. PV and I traveled to her softball game with other family members. When we turned down the road we live on about 10:00 pm Milton was cutting in the field. There's something about seeing a combine with it's lights on that makes you stop and think. Way past sunset still going. 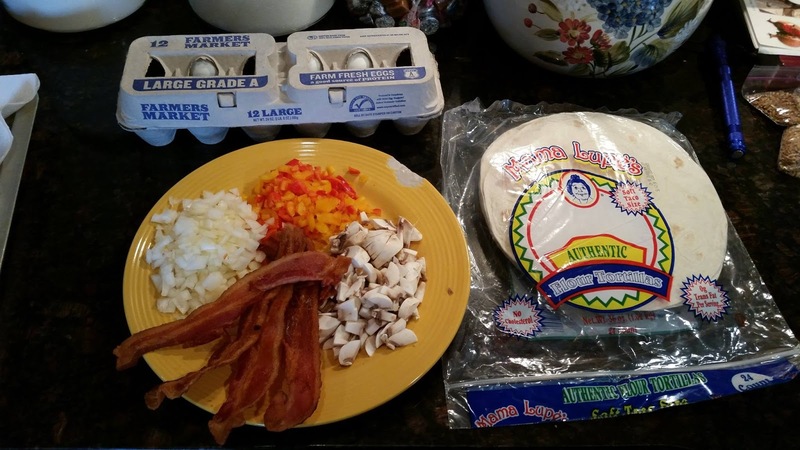 Harvest meals: Lunch was homemade breakfast burritos with other easy to eat items. Taken to the field and left for the farmer! Supper was Tator tot casserole and green beans. 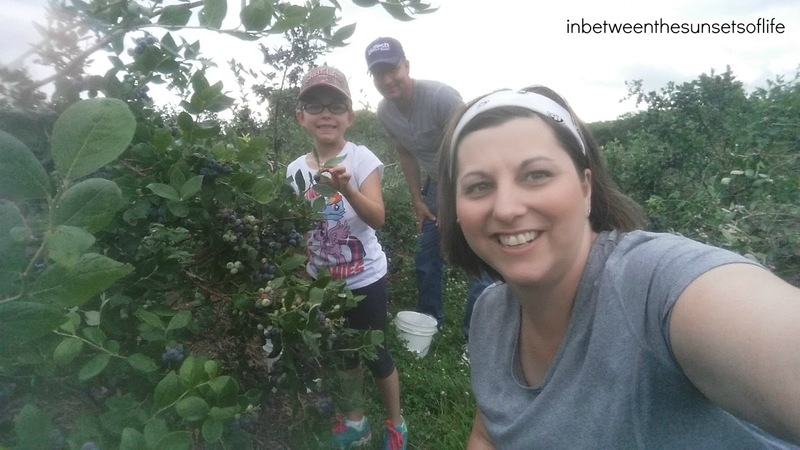 The farmwife started her day by going for a short walk at 6:00 am. I wanted to let the farmer sleep just abit longer and I needed to clear my mind. When I returned of course he was up and I made him a couple eggs for breakfast. We then headed over to get going for the day. Milton started working on the combine to fuel and maintenance it, the grain truck was next to review. I headed to the elevator leg and started adding up tickets. I enjoy this job and also the fact that in the early morning him and I have some time together working. You can check out our daily stats at the bottom of this post. It was a pretty good day and the farmer was happy with the results. My father in law headed to a field to start picking up large bales. They need to be moved to the farm. 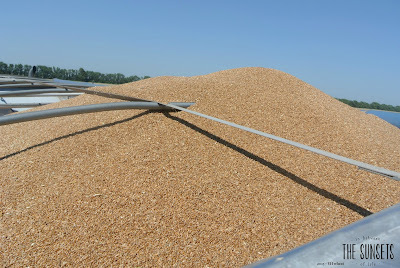 Since we bin our own grain at the farm I think I might do a post about how we weigh and unload a truck. So look for that post in the future! Our grandkids were able to come out and spend the day with us. 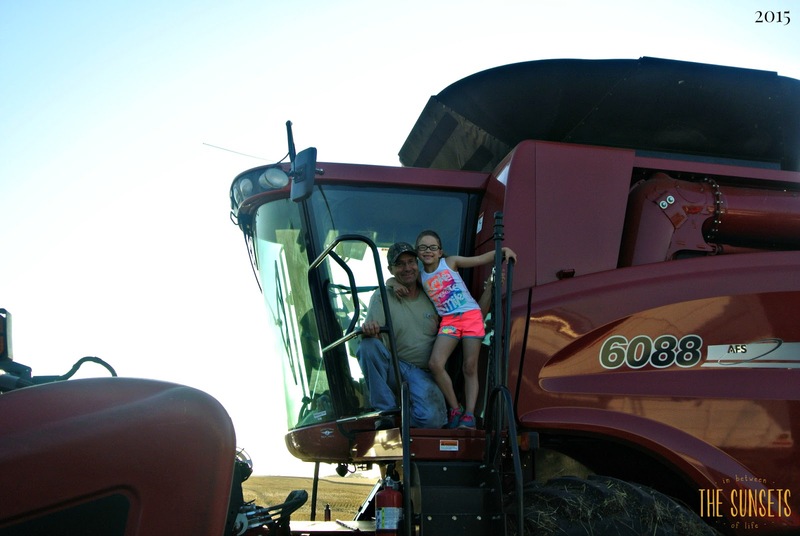 One of them has never experienced wheat harvest so this should be a fun time for all! 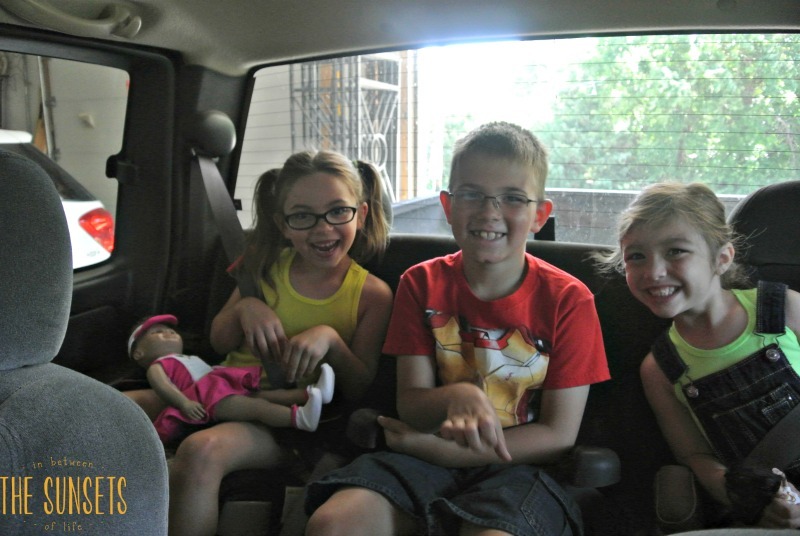 They helped me prepare meals, swam, rode in the combine, and read. These two kiddos and PV have a blast when together! Finished MV28, moved to SPVRV28, then to EH28. Meal: Fried Chicken, Potato Salad, Watergate salad, and Bread. Our day two of wheat harvest fell on Father's day and also Tashley's 27th birthday. I always seem to recall the first June Milton and I were dating right around this time of year. I was not accustomed to waiting for anyone, especially when my kids were involved and he had lived a long life of farming. 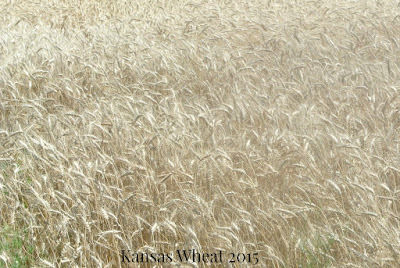 Wheat harvest was going and I had Tashley's birthday party planned. Needless to say he came late, and I wasn't real thrilled with him. The party was over. But, all these years later both of us have changed. I've learned more about farming and he has became a man that sets priorities better. This doesn't mean he is at every event of the kids but he really does put them before the farm more than 90% of the time. I'm proud of him for that. Here is an example of why I make the statement I just did. He took the time to hang PV's new tire swing prior to heading to the field on day two. 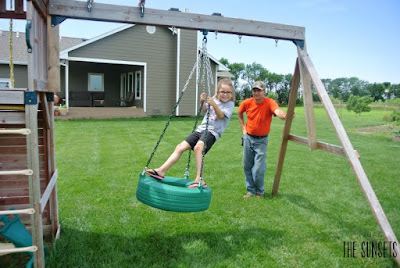 She has been wanting one since early May and we had one hid and wanted to surprise her. We thought this would be a good time, she might need more occupation later in the week with Dad gone so much! 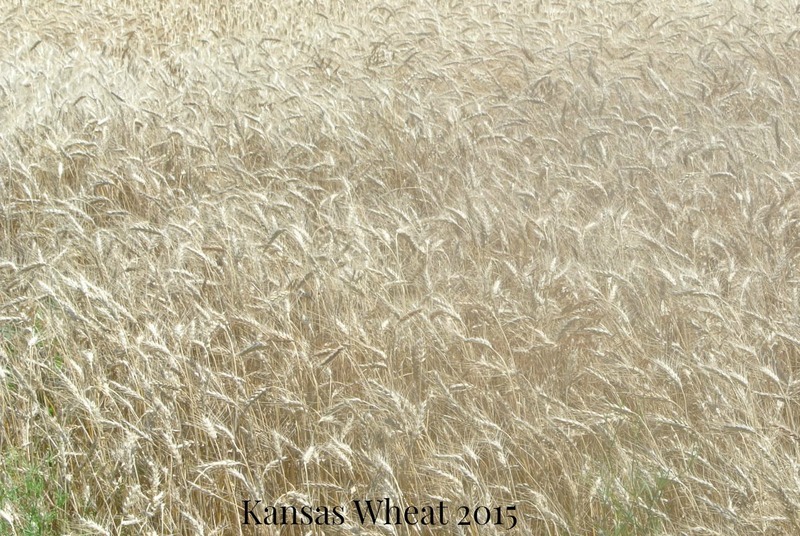 I know, you came here to hear about our Kansas wheat harvest, so here goes our update for day two! We finished the field that we started on day one around 3:30 pm. Heading to another field we rent (32DO) to begin harvesting there. The weather was hot, humid, and windy. We won't complain though because right now the rain needs to stay away. 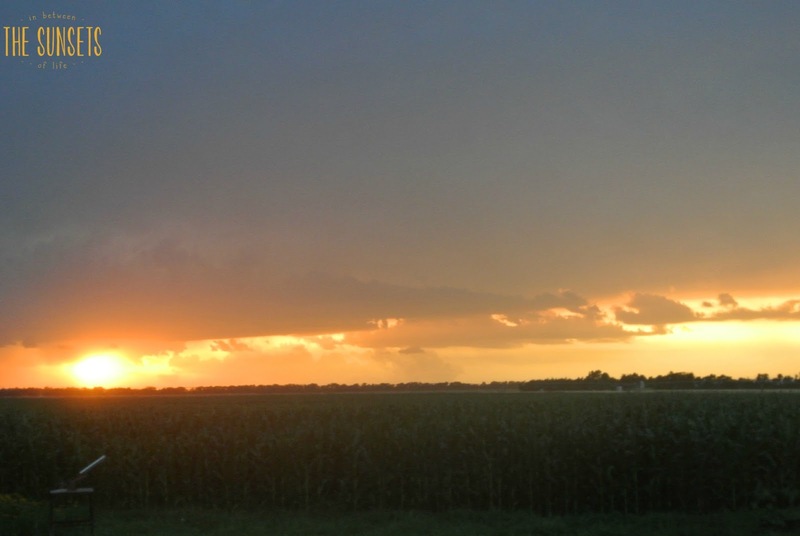 The field of 102 acres was finished between 8:30 and 9:00 pm. PV and I went for a combine ride after she had her softball practice. It was an enjoyable ride and spending time with Dad is always a good thing! Dinner was dropped off at the field around 6:00 pm and we didn't eat together. Kiddo had softball practice! 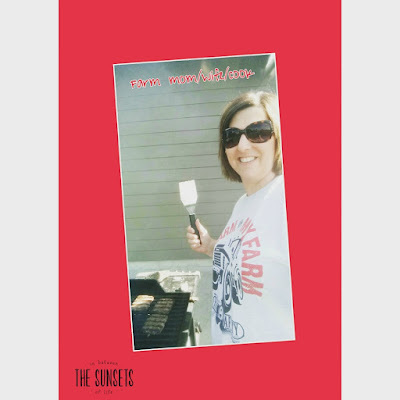 I served hot dogs, hamburgers, cucumber salad, watermelon, chips, and baked beans. Dessert was chocolate chip cookie bars. 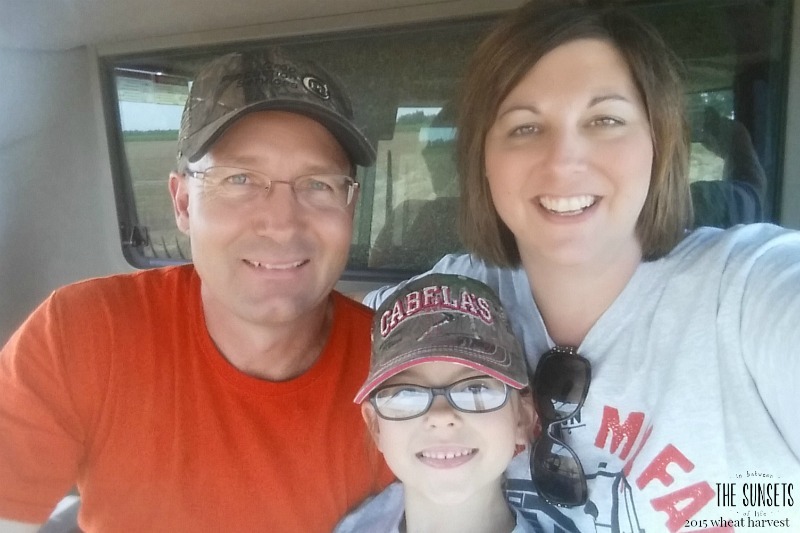 Our annual family photo from the cab of the combine! Moved to new field DO32, finished. Moved to new field MV28, started. Harvest meal: hot dogs, hamburgers, cucumber salad, watermelon, chips, and baked beans. Dessert was chocolate chip cookie bars. This year's blog posts during wheat harvest will include more details than in the past. These will be for you the readers to get a closer gander, some for our landlords that follow us online, and the rest is for us to look back on. I hope it will begin a conversation about agriculture and provide some education. If you have questions, please do not hesitate to ask in comments or on our Facebook page. If you are interested in when we drilled the wheat last September, check out the post Wheat Sowing 2015! On June 20, 2015,our wheat harvest officially began. About a week before, Milton tried to cut a field but it was still too wet. It was a good test run though since we have a "new to us" Case IH 6088 combine with monitors and such. Practice always helps with new things! 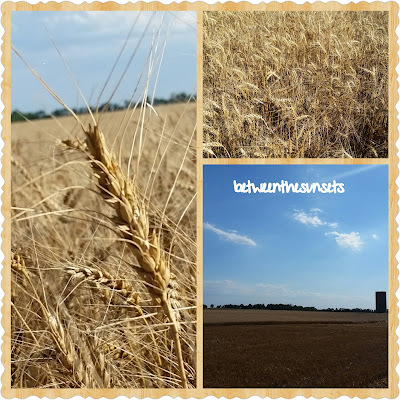 We headed south of our church to some ground (YH32) that we rent to begin harvest. The weather in our part of Kansas was very hot and windy. 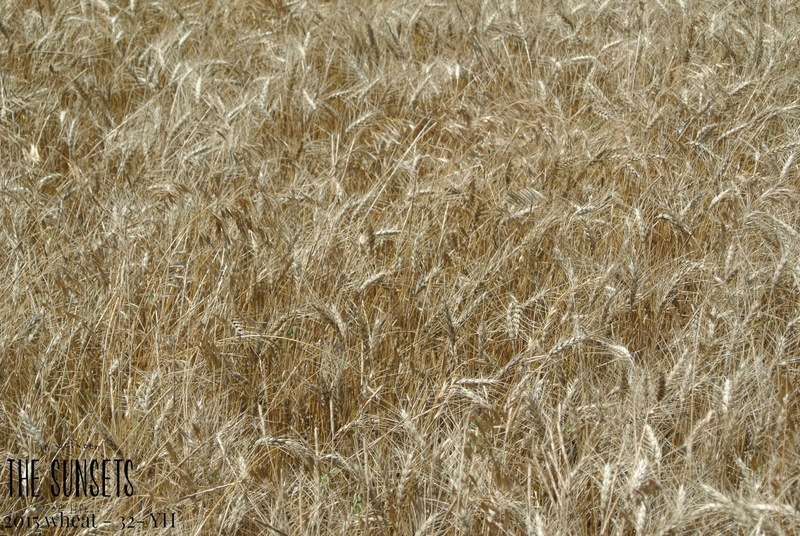 This type is good to dry the ground out and help the wheat to turn. 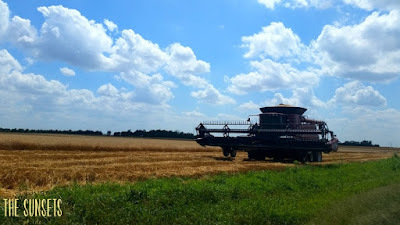 The ground is still wet to some degree and the tires on the combine collect mud, but the wheat is really quite ready to harvest. The moisture is in the area of upper twelves to thirteens. This is a good area for it to be. The fields in our township are buzzing with machines! Other farmers have made their way to the field as well. This will probably last for at least 10-12 days for us, unless rain or breakdowns keep us from cutting. 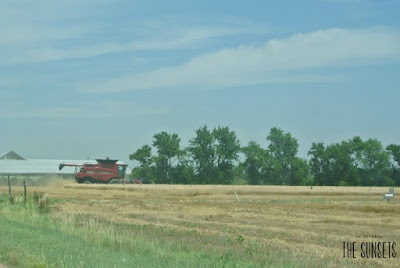 The days will be long for my husband as he runs both the combine and grain drill. 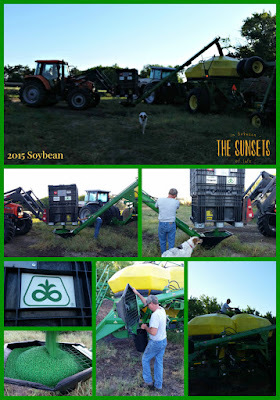 We plant soybeans and grain sorghum (milo) after the wheat is cut in the fields. So he will probably rise very early come next week to plant and then hop in the combine late morning. That's where he will be until late night. 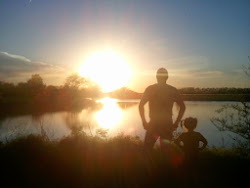 I will spend my time fervently praying for safety, strength, and energy for the man that provides for our family. I will provide meals, weigh trucks, haul snacks to the field, take combine rides, and haul his kiddo to her destinations! 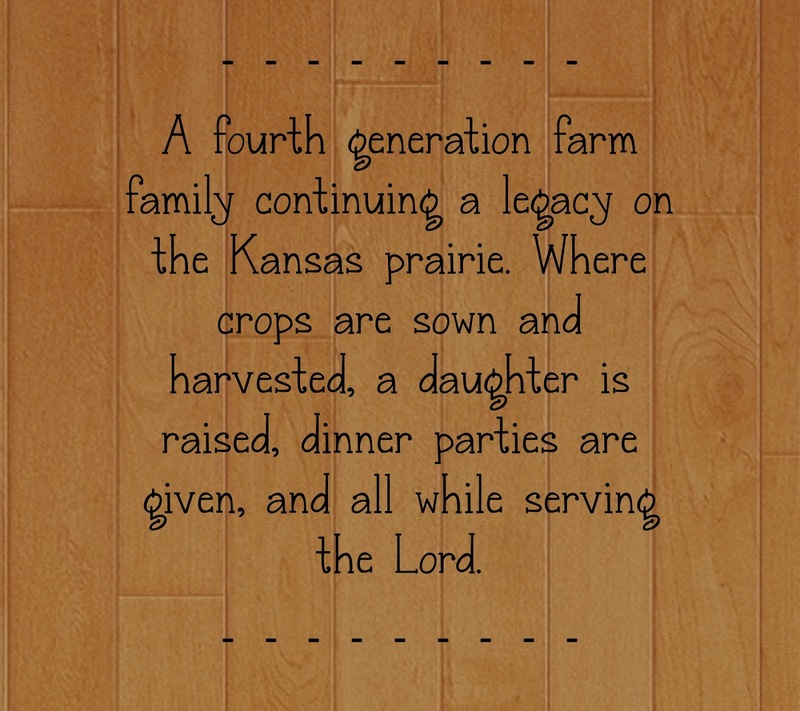 Please pray for all farm families that are in the midst of wheat harvest and planting. It's always greatly appreciated. It was really dry last September and October! One of my oldest daughter's favorite recipes is Mancotti. I was whipping up a pan for her birthday this past weekend which inspired me to make stuffed shells. Normally I would make them just as I had for her Manicotti, but I had some italian sausage in my frig to use up. So I made stuffed shells for lunch and used the sausage! Our family enjoyed them for lunch! It will be one we make again! Cook the pasta shells in boiling water for about 9 minutes. Drain and lay out. Cook the italian sausage until done. Mix together the ricotta cheese, 3/4 cup mozzarella, and 3/4 cup parmesan cheese, and the italian sausage. Pour a layer (about half) of the spaghetti sauce on the bottom of a 9x13 cake pan. 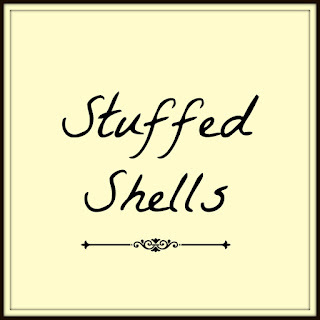 Stuff the cooked shells. Put them in the pan. Pour rest of spaghetti sauce over all of them then put rest of cheeses over the top. Bake at 350 for about 20 minutes or until heated through. Don't let the title worry you, this recipe is pretty simple. Most of the ingredients are probably staples in your pantry and refrigerator. 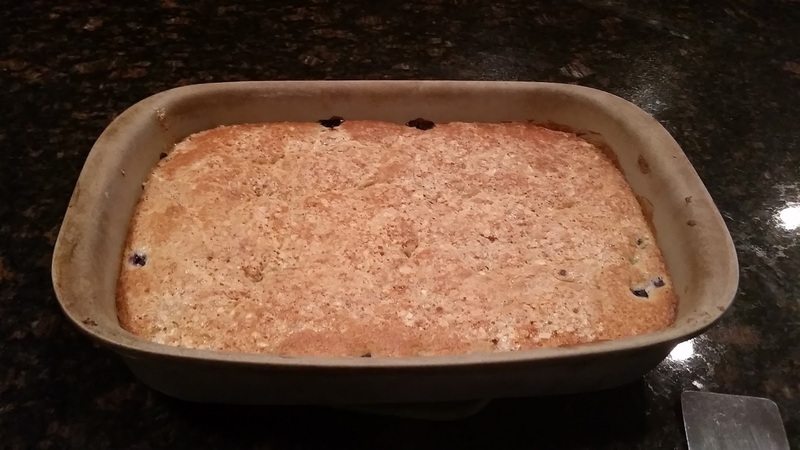 PV and I made this coffee cake after we traveled one Saturday to pick blueberries at The Berry Patch. I highly recommend them if you have a desire to purchase blueberries. 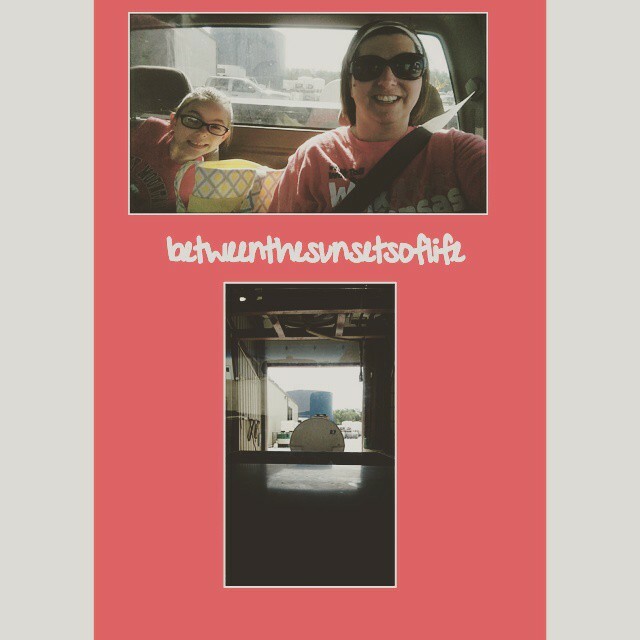 It was a jaunt for us but we didn't mind. 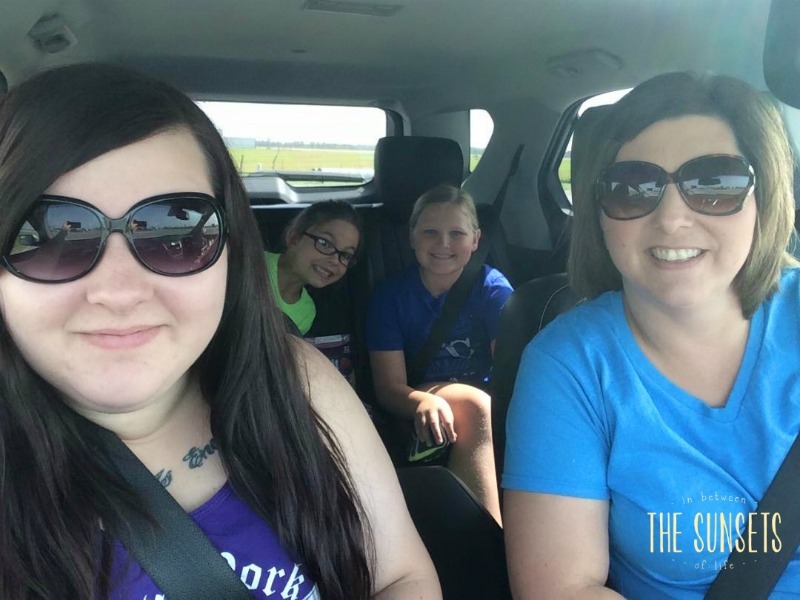 We were in the mood for a road trip and a free Saturday in June due to rain! This will be one of those cakes we make again and again. Especially since we have 21.5 pounds of blueberries in the freezer! :) Also because it includes almond flavor and I love that! We hope you enjoy the recipe. It was supplied by another orchard that we stopped at on our way home. Pome on the Range. We picked up some absolutely awesome tasting peaches! They also gave us some advice on how to care for our peach trees we have here at home. So glad we stopped there too! Sift flour, baking powder, salt and set aside. Beat butter and sugar until light and fluffy. Beat in eggs and almond extract. Add flour mixture and milk beating on low speed. Fold in the berries. Spread mixture in baking pan. Prepare topping; lightly beat egg white and add sugar and almonds, stirring to coat. Spoon mixture over batter and spread evenly. Bake 45-50 minutes. Cool and serve.